For several weeks we have been looking for one item that will be needed for NHL’s Halloween costume. You would think that it had to be something horribly complicated since it has taken us so long to find. The sad truth is that it was only a plain white turtleneck shirt. Who knew that this would be so difficult to find here? Yesterday we were on a mission. We opted to go to the more "quiet" of the malls to see if Sears had the pesky white turtleneck that we desired. On the way there we stopped for lunch. We have been curious for a while about a pizza place that had opened on the route there back in the summer. We finally went in. They have what they call "The Big Mama" pizza. This pizza is HUGE by any standard. It is a 30" pizza and the slices are larger than our heads. The boys ordered some slices and I just had to take a photo of these monster slices. We really enjoyed the food there and the owners were extremely nice. We will definitely be going back again. After lunch we went to the mall. Our first shop was Sears. Once we made our way to the boys section we almost gave up. Then out of the corner of his eye, JL saw turtleneck shirts. We purchased a white, red and pattern one for NHL to stay warm this fall and winter. Next we wanted to head to one other store in the mall. NHL was exhausted. We think the pizza must have made him sleepy. 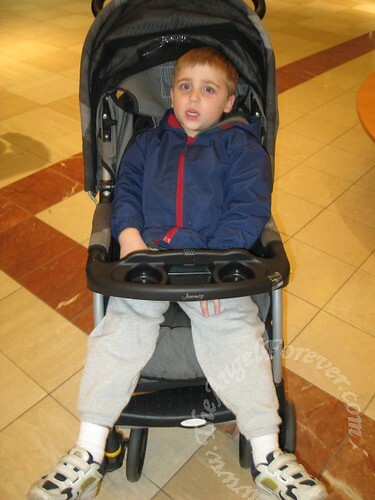 Luckily JSL was antsy and wanted out of his stroller. So I decided to stuff NHL into the stroller and he was willing to go for the ride. On our way back to the car we stopped at the Sears Portrait studio to make an appointment for NHL’s 5 year portraits on Sunday. Last week we had to cancel them thanks to his pinkeye. The appointment was made and I decided that I wanted to finally go through with something I had been thinking about. I have been toying with getting my hair cut again for quite some time. I knew pretty much what I wanted to do, but I could not decide where to go to have it done. With the budget being smaller these days, I opted to go where the boys get their hair done. There is just something about not spending more than $15 for a simple hair cut. When I went in I asked the hair stylist to take a photo of my hair before. 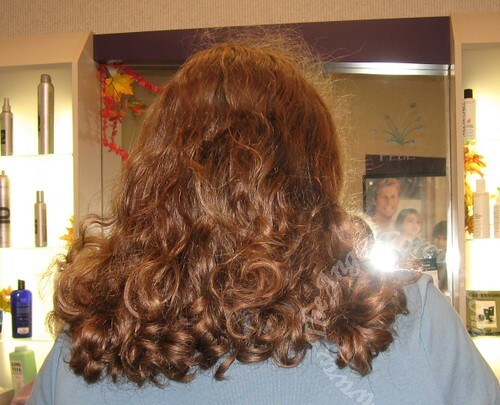 I had not had it cut since I had 12 inches taken off for my third hair donation after JSL was born. Now my hair is finally bad to the thickness it was before the pregnancy and is quite long again. Thanks to this it is hard to work with and quite heavy on my poor head. Please ignore the frizz, it is the story of my life (even with products made specifically to combat that issue). I simply asked to have my hair cut to about shoulder length so that I could still get it back and out of my face if I wanted to. She worked and worked and worked on it. You should have seen the pile of hair on the ground. 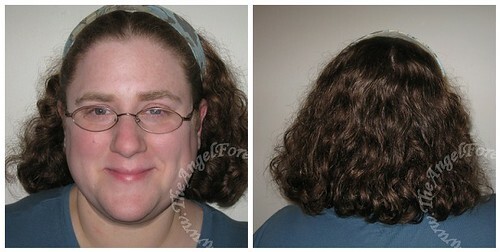 I must have had at least 7-8 inches cut off thanks to the curl factor. When it was done I felt so free. We went home and I immediately found my headbands to push it back (wearing the one that Airing Dirty Laundry gave me in our Swaparooni last year) . Here is what it looks like after. Please note I did not have my hair colored. The lighting in our dining room is that bad that it made my hair look really dark. The photo above is pretty accurate. So today we will have NHL’s portraits done and try for our first real family portrait. All of our red shirts and jeans are ready to go! I think it looks great. It’s amazing what taking off length can do. Mine grows SO fast that it gets away from me quickly. Cute! I love the color and curl of your hair. I have really thick hair, too, though, so I relate about it being heavy. I get my hair thinned once or twice a year.